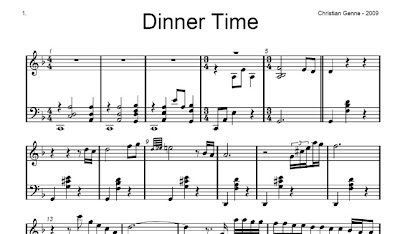 Genne's Blog: My first piano sheet successfully created! Just recently finished my first piano sheet based on an improvisation I made some years ago. Not that I was planning to do anything serious with it, just to learn and to some day be able to say: "I've produced my own piano sheet". Well, now I can :) There are some things I know I could make better, but it takes too much time figuring out how to do it in Cubase (which I used to produce the sheet), so I'll just let it be as it is now. It was really fun producing it, so I'll definitely continue doing so. And hopefully it won't take so much time in the future! Update: My server isn't up and running anymore, but you may actually find my music on spotify! Thank you Gus, I like the Keith Jarrett reference :) I have quite a few other songs which I've recorded over the years... maybe time to publish them as well? :) I'll look into it!